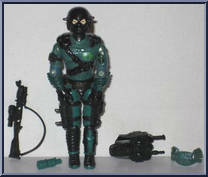 The ALLEY VIPERS are the Cobra equivalent of a police S.W.A.T. unit or British S.A.S. (Special Air Service). 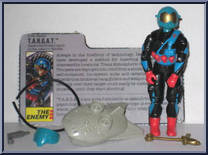 They form the spearhead of Cobra's inner-city invasion forces. This elite contingent of mar. 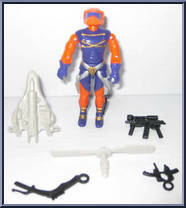 . .
ANNIHILATORS are DESTRO's personal bodyguards and elite airborne assault troops. They can be deployed by sea, air, and land "take-off" with their mini-turbine Heli-packs on their backs and d. . .
BACKBLAST grew up in a house next to one of the busiest airports in the world. His bedroom was directly under the landing path of incoming jets. At night, the landing lights from descending jumbo-jets. . .
Satellites are used by every major power for visual surveillance, electronic and infrared intelligence gathering, and as weapons platforms. 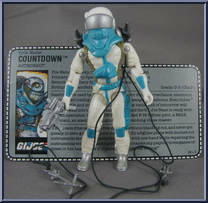 Even Cobra has a shuttle and its own spy satellites. The bat. 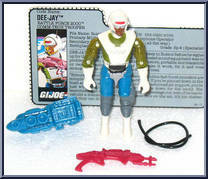 . .
DEE-JAY was the baddest, hottest disc jockey in Boston before he signed up for the Battle Force 2000 team. Complicated sound equipment was no problem for him. If it is loaded with transistors, portabl. . . 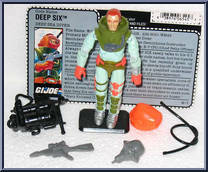 Always a loner and an individualist, DEEP SIX rarely talks to his G. I. Joe teammates and barely remembers their code names, but his loyalty to the organization is unquestionable. He has recently give. 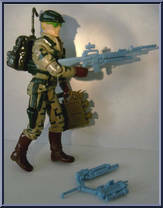 . .
A highly mobile, rapid strike force like G. I. Joe can't depend upon slow, ponderous artillery to keep up with them. 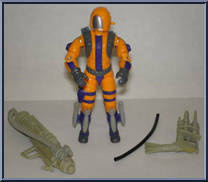 They need to bring their own fire-support with them in the form of a high-powered m. . .
An integral part of the Cobra Viper fire-team, the FRAG-VIPER can toss high-explosive fragmentation grenades with all the range and accuracy of an M-79 or M-203 R.P.G.L. [Rocket Propelled Grenade Laun. . .
GNAWGAHYDE could have single-handedly decimated the herds of all the endangered species of Africa, if his fellow poachers hadn't railroaded him off the continent for cheating at cards, being generally. . . The new generation of Cobra anti-tank specialists are equipped with the latest in hyper-kinetic, high-speed, wire-guided, armor-piercing technology. The harness supported launch tube has active heat v. . .
A NIGHT-VIPER's helmet is a miracle of electronic-miniaturization. Aside from its wide-angle, third-generation, image-intensifier, directional sound amplifier and laser range-finder, the helmet boasts. 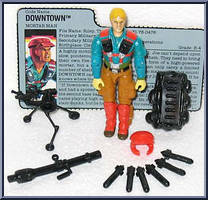 . .
RECOIL was a marathon runner and professional body builder before he joined G. I. Joe. His excellent physical shape put him in good stead to be a "Lurp." A Lurp sneaks out into the bush carr. 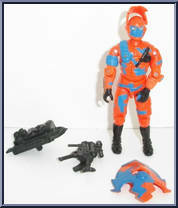 . .
ROCK 'n ROLL has served with the G. I. Joe team since its inception and has been consistently updating his equipment and his skills. These days, his "primary iron" is the General Monopolies . . . It takes a special kind of guy to step out from behind cover during a firefight and keep his finger squeezing the trigger-of his videocam! With an advanced degree in journalism, as well as a master's . . .
Subject was Ranger qualified and graduated from Recondo School in Nha Trang prior to his service with a Long Range Recon Patrol unit in South East Asia. It is generally accepted that he received exten. 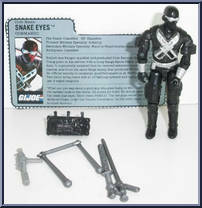 . .
One of the original members of the G. I. Joe Team, STALKER served in the same L.R.R.P.unit with SNAKE-EYES and STORM SHADOW in Southeast Asia. He is a graduate of the Army Languages School in Monterey. . . 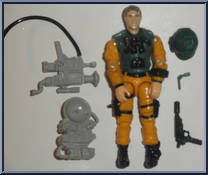 Always in the forefront of technology, Destro's technicians have developed a method for inserting troops into totally inaccessible locations. Trans Atmospheric Rapid Global Assault Troopers are deploy. . .